Time for another installment of Use up the Stash. I'm actually finishing products and running out of stuff. I have no liquid shampoos at the moment so my Bobeam bars are getting used regularly. 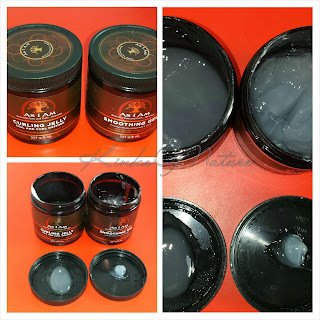 Alikay Naturals Creme Brulee Curling Custard: Check out my first impressions here. My thoughts are still the same after finishing the entire jar. BASK Truffle Butter: I love this stuff, but I had the misfortune of spilling most of it. It had melted, and I did't know and wasn't paying attention when I opened it. Definitely a repurchase. Kiss My Face Upper Management Gel: This used to be one of my HG gels, but it stopped working for me. It felt drying. The formula I have is discontinued. There's a new one out with a completely different set of ingredients. I'm not really interested in trying it. KTC Coconut Oil: This is a refined coconut oil that can be found in grocery and beauty supply stores. It's an inexpensive and accessible option when I can't get my hands on extra virgin or virgin coconut oil. I've finished an 8oz and 16oz of this oil. I use it for cooking, skin, and hair so I go through it quickly. I'd repurchase. Shea Moisture Raw Shea Chamomile & Argan Oil Baby Head-To-Toe Wash & Shampoo: I didn't like this as a shampoo. It was drying and tangled my hair. I used most of the bottle as body wash. It only takes a small amount to get a good lather. Not a repurchase. Soultanicals Mango Dip Detangling Slip: Check out my review here. Soultanicals Master Hair Cleanse Curl Detox: I liked this. It really cleansed my hair and helped to remove that semi-permanent color that refused to be removed with shampoo. My main qualm is that an 8oz container is not enough product when it comes to a clay mask. I used most of the jar for 1 treatment, and my hair isn't that long. The detox is also a little watery and it separates so it can be a bit messy. I wouldn't repurchase this because it's just not cost-effective for me. I can make my own clay mixes for less. Taliah Waajid Black Earth Products Protective Mist Bodifier: Check out my review here.